Offsite Online Auctions: We offer a 3,000 sq. ft. secured indoor auction facility with 2,000 sq. ft. additional outdoor space. This option gives more privacy to you & a great option if parking is limited or the location is hard to navigate. Onsite Online Auctions: This option is a good selection for estate sales or large sales that would be too cumbersome to move to the auction facility or maybe the sale would not be able to financially support a move. – A large marketing demographic: From printed advertisement to online advertisement we’ve got you covered! Online syndication to over 90 websites including: AuctionZip, AuctionLook, AuctionGuy, AuctionGuide and more. In the digital age that we live in, most of our bidders find it much easier to attend an online auction from the comfort of their homes. Comfort for the bidders can mean maximum return to you. Our online platform has pooled thousands of bidders from across the world and will provide your auction with an array of bidders! -Buyers are able to view the items on your sale in person during 2 preview days prior to the closing of the online auction. This will give comfort to the buyer to bid after seeing the items in person. – Cutting edge Online Auction software gives the bidders a “live auction” feel while bidding. Using the software has its advantages, with maximum “ebay style” bidding & a “soft close” bidding option. This ensures that bidders are able to continuously bid more aggressive to win their items until all bidders have spent maximum amounts before the bidding will close. Offsite Live Auctions: We offer a 3,000 sq. ft. secured indoor auction facility with 2,000 sq. ft. of additional outdoor space, we also offera tent option if additional space is needed. This is a great option as it will give more privacy to you & a great option for bidders to park if parking is limited or the location is hard to navigate. Onsite Online Auctions: This option is a good one for estate sales or large sales that would be too large or cumbersome to move to the auction facility or maybe the sale would not be able to financially support a move. – Buyers can view the items & take the items home that day, which ensures most items will be removed the day of the auction ending. – Buyers enjoy the competition of seeing who their bidding against; this may bring more of a return back to you since competitions can only have 1 winner! – A large marketing demographic. 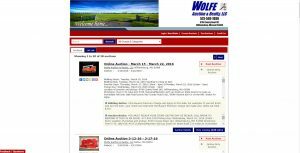 Online syndication to over 90 websites for additional exposure to your auction including: AuctionZip, AuctionLook, AuctionGuy, AuctionGuide and more. In addition to online advertisements our company knows that printed advertisements like 3,000+ sale bill mailing list & ads in the papers will draw in buyers! By having a versatile marketing plan we are able to reach out to an optimal amount of bidders. – Cutting edge Auction Software. Our auction software has computerized clerking & automatic invoice totaling. This provides a quick & easy checkout process to your bidders and the seller will know that day what their sale total is. We at Wolfe Auction & Realty, LLC are proud of our reputation and of the respect we have earned in the past. Why not let us earn yours in the future? Wolfe Auction & Realty, LLC is a full service, professional auction & real estate company…call us today for you free consultation! Wolfe Auction & Realty, LLC believes in the auction business and the open market, free enterprise system that it encompasses. Everyone has an equal opportunity to purchase and the seller knows his auction was held in a competitive atmosphere. Whether it be the dispersal or purchase of real estate or personal property, consider the possibilities of reaching your goals with the help of Wolfe Auction & Realty, LLC. 1. No matter how you dispose of your property there are costs. The auction method gives you the greatest opportunity to generate the most money in the shortest time. 2. An auction allows the public to set the price. There is a bargain sold at every auction, but the total sale will be fair and representative of the merchandise offered. Auction marketing is that unique sales process that actually allows the property or item to reach its top potential that day! 3. As your auctioneer we provide the dynamic, powerful salesmanship you are seeking. At each individual sale we are your negotiator with the crowd. 4. Auction goers are knowledgeable about products and prices. These people attend regularly and although friendly, keep the bidding competitive to protect their own interests. Therefore, these auction goers know that they must bid now or they will lose the opportunity to buy an item. 5. We put forth our best effort because the success of your auction represents us, our company, and is our best advertising. Our livelihood rests on our ability to contact the proper buyers in order to receive the highest price attainable. 6. We seek out customers for your auction and maintain a mailing list of people interested in particular items. We also use other organizations and resources to contact those individuals interested in your merchandise. 7. We are your advertising coordinator. We work with you to determine what is necessary to get the most interested people to your sale at the most affordable price given the merchandise offered. 8. We do not have personal ties or fond memories concerning the sale of the items and can, therefore, act as an impartial arbitrator with the crowd. 9. We know how to “sell”. Learning the auction chant is easy. More important is product knowledge attained through continued education and years of successful experience that will help generate the top dollar you are seeking. 10. Our auction service is a complete “turn-key operation”; fully equipped with tables, display cases, signs, tents, and a cashier trailer; we can handle every aspect of the auction for you. We offer a 3,000 sq. ft. auction facility as well as a 60’x80′ tent! We offer our facility free of charge for Sellers who need this option.